It’s amazing what you can get done in less than 45 minutes using a drone! The deployment of 10 of our low-cost, high-accuracy GNSS ground control units not only enables us to achieve spatial precision of 1-2 cm in X, Y, and Z, but also allows us to offer detailed, rapid surveys at a highly competitive price. The figure above shows two outputs from a recent survey of stockpile volumes, covering an area of ca. 6 Ha, with a Ground Sample Distance (GSD) ≤ 2.15 cm. The 3D model is based on “structure from motion” digital photogrammetry, using ca. 880 photos taken from a multi-rotor UAV. 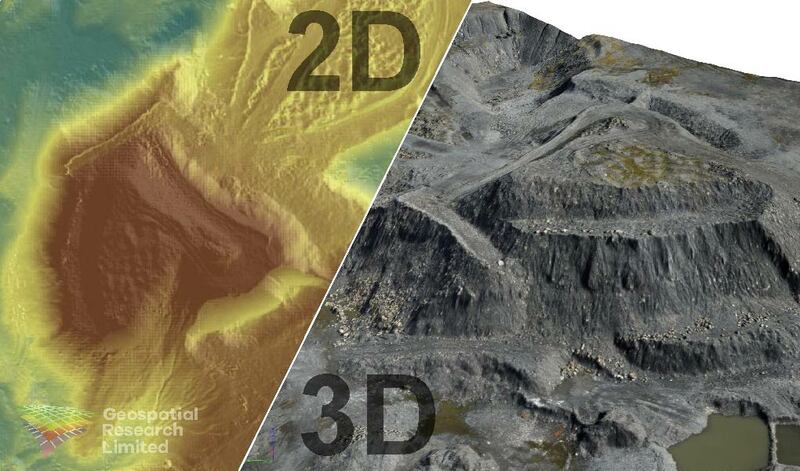 Stockpile volume calculations derived from this kind of 3D model are highly accurate – as long as your survey includes a sufficient number of precisely positioned Ground Control Points. (Geospatial Research Ltd. are authorised by the Civil Aviation Authority for commercial drone operations: PfCO ID = 4430).